Genevoix? Who? When? 1926 to be precise, the eighth book of a French author who had received moderate acclaim for his memoirs of the Great War and who had not, if The Fishing Box is anything to judge him by, achieved anything approaching peace of spirit. Genevoix’s book makes a perfect counterpoint to Lizarralde; The Fishing Box being a book about fishing which is darkened by the effects of war, whereas Lizarralde is the reverse side of the same coin. My own opinion is that this is the best Medlar book published in a while, which is saying something, given the strong competition it faces. 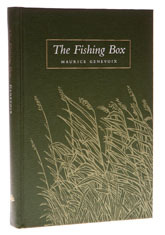 Genevoix treads at the very edge of blurring fishing scenes into battle, hinting at the horrors he had witnessed in accounts of otherwise perfectly ordinary fishing days, yet despite this, The Fishing Box is still a book about fishing and fishermen, rather than battles. Dexter Petley and his partner Laure Claesen did the translation and if they find any more French fishing classics, I will be first in the queue to read them.